Currently, MDN is wholly funded by Mozilla Corporation, and has been since its inception in 2005. The MDN Product Advisory Board, formed in 2017, provides guidance and advice but not funding. The MDN board will never be pay-to-play, and although member companies may choose to sponsor events or other activities, sponsorship will never be a requirement for participation. This payment experiment was discussed at the last MDN board meeting and received approval from members. Starting this week, approximately 1% of MDN users, chosen at random, will see a promotional box in the footer of MDN asking them to support MDN through a one-time payment. Clicking on the “Support MDN” button will open the banner and allow you to enter payment information. If you don’t see the promotional banner on MDN, and want to express your support, or read the FAQ’s, you can go directly to the payment page. Because we want to keep things fully transparent, we’ll report how we spend the money on a monthly basis on MDN, so you can see what your support is paying for. We hope that, through this program, we will create a tighter, healthier loop between our audience (you), our content (written for and by you), and our supporters (also, you, again). Throughout the next couple months, and into 2019, we plan to roll out additional ways for you to engage with and support MDN. We will never put the existing MDN Web Docs site behind a paywall. We recognize the importance of this resource for the web and the people who work on it. 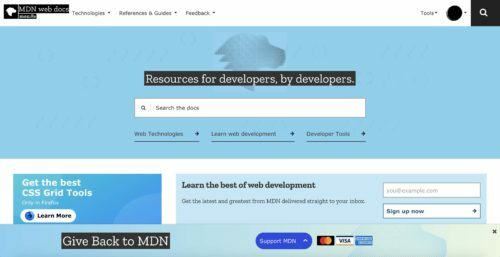 The post A New Way to Support MDN appeared first on Mozilla Hacks – the Web developer blog.